Two of Mexico's celebrated architects, Alfonso Lopez Baz and Javier Calleja, are introducing to Punta Mita the architecturally inspired oceanfront residences of Vientos del Mar. This magnificent luxury Villa located within the gated Punta Mita Residential Community in Lagos del Mar, Casa Terral offers an abundance of striking beauty and sophistication, architecturally, artistically and naturally. This feeling is even more enhanced by the almost exclusive use of natural materials, such as wood, marble, other natural stones and the palm leaves that crown the roof of this fantastic home. Characterized by open and flowing floor plans, they offer an average of 8,000 square feet of living space accentuated by rich hardwoods, Travertine marble, hand-trawled stucco and top-of-the-line kitchen appliances. Numerous terraces accompany three over-sized bedrooms, a spacious master suite and an au pair's quarters to make these homes exceptionally livable. The luxurious five-star Terral Villa is a place for escape and indulgence. 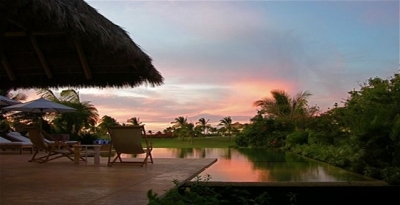 Overlooking the breathtaking Pacific Ocean and within prime proximity to the famous Jack Nicklaus Signature Golf Course. Property rentals include: Personalized residence or villa orientation tour, Use of the Residents' Beach Club (subject to prior reservation and availability). Residential Concierge services: Pre-arrival itinerary planning, Airport pick-up and drop off, Pre-arrival grocery shopping, In-house or villa spa services, Baby sitter service, Car rental arrangements, Restaurant reservations, Booking of tours and excursions. Check-In: 3pm. Check-Out: 12pm. One week minimum stay required during Peak Season. Rates include maid service and cook service for breakfast and lunch. Rates are subject to 16% taxes and 5% service charge. A rental deposit in the amount of 50% of the entire rental and a refundable security deposit equivalent to one night's stay is due at time of booking. All cancellations should be made in writing and are subject to a penalty charge of 20 % of the total rental amount. There will be no refunds for cancellations made within 60 days or less of arrival or cancellations made during Peak Season. Children are welcome. Pets require prior authorization and a security deposit. Smoking is prohibited inside the villa. Please inquire if you require additional amenities included (i.e. car rental, concierge service, etc. ).